We know the Faucet light looks cool but see what other people say. Send us your Faucet Light customer reviews to be proudly displayed here. 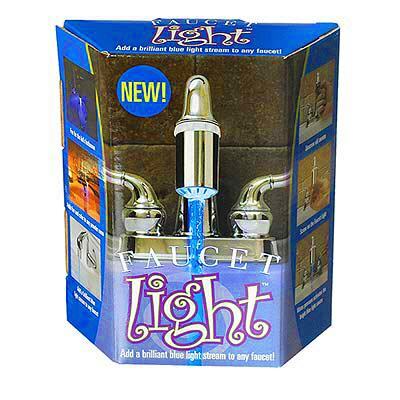 We would love to hear your stories and testimonials of the blue and red faucet lights. Just want to comment on my recent purchase of the two-colored faucet light. I am very satisfied with my purchase. I was very impress with the ease of installation, and it did work in accordance to your claims. I will definitely purchase probably two (2) more for my house. I am sure once my family and friends see this gadget they too will probably purchase at least one. I would like to make recommendation about this product. Can you design a similar product for the shower light? Instead of the colors blue and red, why not try to make it a multi-colored water filtration, eg. blue-green-red-fuschia-yellow. Or have it do blue (cool-cold) to purple (medium temperature) to yellow-red (warm to hot) I believe it would be a nice novelty to sell. Please reply if you are planning such a project.